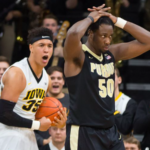 IOWA CITY, Iowa – Despite leading for less than 13 minutes, Illinois came into Carver-Hawkeye Arena and handed Iowa their third straight loss. The Hawkeyes fell in a close game, 70-66. After struggling to hit threes in the first half, Illinois was given some open looks in the second half that contributed to their nine made three point shots on the day. Malcom Hill led all scorers for Illinois with 21. 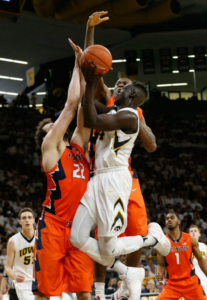 The Hawkeyes were left in a scoring drought late in the second half as Illinois went on an 8-0 run to put the game nearly out of reach for Iowa. It was only by two made free throws by Peter Jok that kept Iowa scoring. After a steal by Nicholas Baer that led to a dunk at the other end, the Hawkeyes looked to have run out of energy. Baer scored 8 points, shooting 2-7 from three-point range. 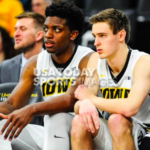 Iowa played in the full court press for the majority of game, forcing 17 turnovers including the steal by Baer and another by freshman Cordell Pemsl. 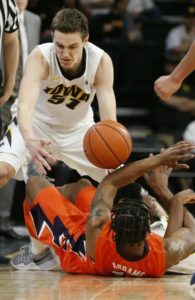 Illinois scored 32 points in the paint, many of which came by an opening left in the full court press defense by Iowa. The press did allow for a spark inside Carver, after the two big steals the crowd regained some of its energy. “Anytime you press you are going to be susceptible to things down the floor, but overall I think the press was effective,” Baer said. Iowa was led by senior Peter Jok with 16 points and 10 rebounds, marking his fourth double-double of the season. Jok took a lot of the blame for the loss to Illinois, he shot four points below his season average of over 20 points per game. The game was dominated by one team making quick scoring runs. Both team had 8-0 runs late in the game. 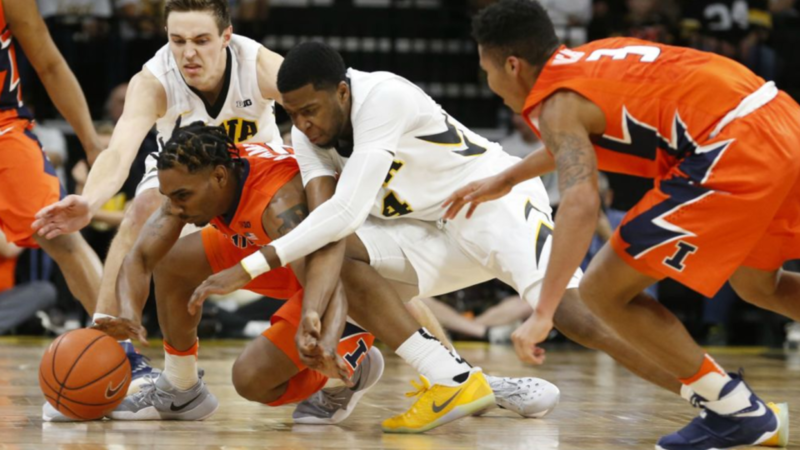 Momentum shifts throughout the game characterized how both Illinois and Iowa played. Illinois closed out the game on the line but gave Iowa a glimmer of hope with four missed free throws in the final minute. They only show 7-14 from the free throw line, none of which came in the first half. Iowa on the other hand shot 17-22 from the line. Peter Jok missed a free throw for the second in a row after making 28 straight shots from the line. Ten players played for more than ten minutes during the game, only freshman Ryan Kriener played less. The deep rotation is attributed to the young roster Iowa has, sometimes that youth can lead to mistakes. 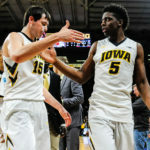 Iowa will play next against Indiana at home on Tuesday. That game is scheduled to begin at 8 p.m. CT.